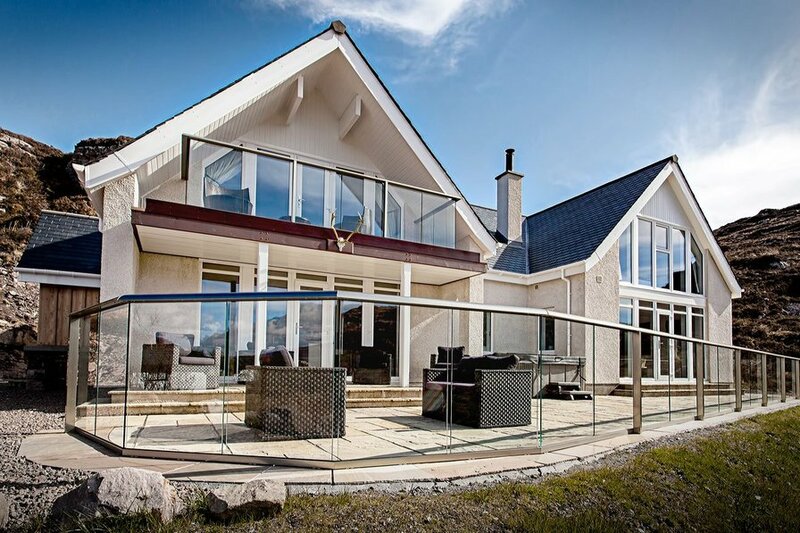 A luxury five star holiday home nestled peacefully on the bay of Ardmair looking across to the Mountain of Ben Mor Coigach and the Isle of Martin. Ardmair Bay House is available for holiday rentals throughout the year and our accommodation sleeps up to eight people. This superior holiday home is a genuinely luxurious experience and allows guests to enjoy exquisite living in majestic surroundings and is ideally placed for exploring the rich and diverse Scottish Highlands and Islands. Ardmair Bay House was completed in November of 2011 as a purpose built holiday providing many of the luxuries of a hotel with the relaxed, comfortable and informal atmosphere of a holiday home, decorated in a contemporary style complimented by modern finishing's and designer bathrooms. We have also build the house with a priority to the environment and particular emphasis to the insulation fibre of the house so we can take full advantage of our wood burning stove and heat recovery system providing a healthy circulation to the house in the summer and winter. Surrounded by fantastic mountains, beaches, fishing and golfing, Ardmair Bay House is in a tranquil location just 1 hrs drive from the city of Inverness and only 3 miles North of Ullapool, a well-known as the gateway to the Scottish Islands. It provides an ideal retreat, perfect for large groups, a family holiday, special occasion, honeymoon, corporate entertaining or a traditional Scottish Christmas and New Year. Ardmair Bay House has four large bedrooms with boutique hotel styled upholstered super king beds. We can accommodate up to eight adults and can arrange a cot if you have a young children. Upstairs we have the three bedrooms including the Master bedroom with large balcony, steel bath, fitted wardrobes and a dressing area. On our ground floor we have a further one bedrooms with large lounge area with wood burning stove, and fully equipped modern kitchen, utility room, bathroom and extra TV room. For your holiday all bedding and towels are provided. You will also find 2 Flat Screen TVs, Sky TV including Sky Sports, Amazon TV, MP3 and DVD player, hairdryer and toiletries in each bedroom for your use during your stay. Each of our rooms have been furnished and decorated to give them their own unique character. Outside we have a large seating area, barbeque and included in the price a luxury hot tub with its 30 destressing massaging jets making Ardmair Bay House a very special retreat!